Dallying In The Dirt, Issue #176 --- Those gorgeous Alliums can become weeds. Summer is here. It’s too hot to pull weeds in the middle of the afternoon so I start early in the morning. That leaves me in the air conditioned office in the afternoon to write “Dallying.” The hardest part is staying awake. The vegetable garden has just one small section left to be weeded. After that main weeding, a short weekly trip with the hoe should keep any new weeds from getting established. I have uncovered a fair amount of bare soil that I need to plant something in. The sections where the rabbits have decimated the Beans and the Spinach are looking for something to fill them up. I’ll get some more Bean seeds and cover them with chicken wire in an attempt to protect them from the beastly bunnies. I should have my rabbit trap operational in the next day or so and then I hope I will be making long drives to find my rabbits a nice new country home. There are a few melon plants left in the cold frame, I’ll probably find a place for them as well. I discovered a bucket of unplanted Gladiolus corms in the basement so they will find some of the empty spaces and give us some late summer bloom. Many of the Roses have recovered from the severe winter and are putting out some wonderful blooms. My very hardy Rose Tree that I created from a Morden Rose is full of bloom and really quite a marvel. 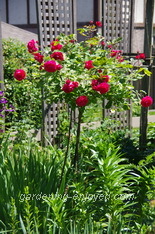 I originally trained one tall stem but recently a couple of other stems grew up from the ground with minimal branching and I have incorporated them into the tree to give me an even bigger head of Roses. 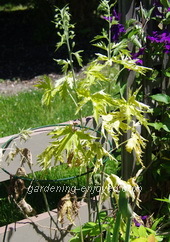 A week or so ago one large clump of my Delphiniums turned completely yellow. I pulled them all out and tossed them in the municipal compost bag. Now the immediately adjacent clump has rapidly gone yellow as well. It will be removed later today. There are some black lesions on the leaves that appear before the leaves turn yellow. All of this appears to happen in a few days but may have slipped my notice for a while before it became so obvious. As I keep reading, there are any number of fungal diseases that attack Delphiniums. I’m not sure that I can actually identify the one that has found mine but it doesn’t really seem to matter. They all are listed as having no readily useable cure. All the sites I checked had the same advice almost regardless of the actual disease that was present. Dig up and destroy the plant and even remove some of the topsoil and then never plant Delphiniums in that location again. Now I have to keep a close eye on the other Delphiniums that are not far away from the infected ones and if I see the disease developing I’ll get out my shears and shovel and forget about having those lovely tall spikes of flowers in the front perennial beds. 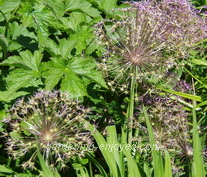 In many locations in the garden various types of Alliums are displaying their amazing blooms. These decorative members of the Onion family come in a variety of colours and sizes. There are mostly various shades of purple but a few white flowered varieties exist as well. There is also one small flowered true blue variety. The flower heads range in size from very compact clumps a few centimeters across to some giant types that are almost 30 cm (12") in diameter with each floret on separate wide spaced stems. They are all grown from bulbs that we plant in the autumn along with all of the other bulbs. The flower heads can be quite decorative even after the florets fade leaving little coloured seed pods on the end of each stem. I’m mentioning these now because most are just finished blooming and we need to know how to deal with them. I have even heard of people who spray paint them to make fancy coloured objects in the garden or in the house as dried arrangements. Not me! There is a problem with some of these plants. Some varieties have very viable seeds and if the seed heads are not removed you will find them all over your garden becoming more of a weed than a decorative item. The easiest fix is to remove the seed heads from all of your Alliums so that the seedling problem never occurs. An easy way to tell if your variety produces viable seed is the cost of the bulbs. Seed producers are easy to propagate and therefore have much lower costs. Some of the vegetatively propagated varieties can retail for several dollars per bulb. After you have tried to eliminate some of the prolific ones from your garden the cost of the sterile bulbs starts to look attractive. Geryl Asks? I have a couple of questions for you today. 1. While I was away for a week, I noticed my creeping jenny was looking pretty sad upon my return. On closer inspection, I see that it is being decimated by 1" white larvae with brown heads. I searched the internet and discovered it is sawfly. Do you have any natural remedies you are aware of? I would prefer not to have to pick these off by hand as there are hundreds. Do you think insecticidal soap or diatomaceous earth would work? Will they spread to other plants such as roses? 2. My rhubarb has gone to seed. If I cut the flower stalk down, can I still harvest the stems and will they taste all right? Ken Answers! Insecticidal soap is your best option. A strong blast of water from the hose will also knock them off and they will not easily find their way back. If you cut the flower stalks out of your rhubarb it should continue to produce new vegetative stalks that are perfectly edible. Brenda Asks? I transplanted some iris last fall from a plant that hadn't bloomed for some time. Not one of them bloomed. It had lots of leaves. Any suggestions as to what I did wrong. I thought perhaps I had planted them too deep. Any other ideas? How often should an iris plant be divided? Ken Answers! You probably did nothing wrong except maybe for the timing. Iris should be dug and divided in mid summer, late July - early August. Your fall transplanting probably left too little time for them to get established but they will undoubtedly bloom next year. Mine get divided whenever the clump gets too big or the centre has died out, about every 5 - 6 years. In cold winter areas we plant them about an inch or so below the surface of the soil to prevent them being heaved from the soil during the freeze and thaw cycles. Bonnie Asks? .I thought the New Guinea Impatiens were not susceptible to the Downey Mildew virus attacking the regular impatien's. Well, my New Guinea's are suffering the same symptom's!! One by one, they are just collapsing. They look exactly the same as the standard one's did before their demise. Leaves turn yellow overnight..and the plant literally seem's to fold into itself. No bug's visible, leave's are not chewed. Plant's get watered daily, a good mix of sun/shade. I'm totally bewildered. This will be the second year, with little colour in my annual boarder. Any idea's? Ken Answers! If what you are observing is actually downy mildew on New Guinea Impatiens then a lot of people including the plant breeders and seed companies are going to be very upset. We have been convinced that the New Guineas were immune and yours is the first report I have heard to the contrary. Just don’t plant any Impatiens in that area, there are several good alternatives in the Begonia family. Lynda Asks? Last year I discovered Water Cress... I loved it but I have been to all the nurseries I know of and I am unable to find any...Does anyone know where I might find some? Ken Answers! Water Cress can be grown from cuttings or from seed. Buy some fresh Water Cress at your local farm stand and look for pieces that have roots. Put them or even pieces without roots, into some water and the roots will grow and then you can pot them up and keep them quite moist. Stokes seeds lists three varieties of Cress in their catalogue. Good Luck and enjoy.